I put together a few quick clips from the FDIC 2014 BullEx live fire demonstrations for you to see. They showed off their Gas-Fired training props and their Digital Fire training props. During the live fire demonstration you can see them attacking a pressurized vessel fire simulating something like a propane tank with a pop-off valve. You will also see them entering a structural fire prop with a Gas-Fired prop on the first floor and a Digital Fire prop on the second floor. The BullEx Digital Fire training system uses a screen to produce the "fire" image and a smoke machine to generate the smoke inside the structure. You can use a nozzle to attack the fire and the screen senses the flow and will dim as you extinguish it. It produces a very realistic look inside when combined with the smoke generator. 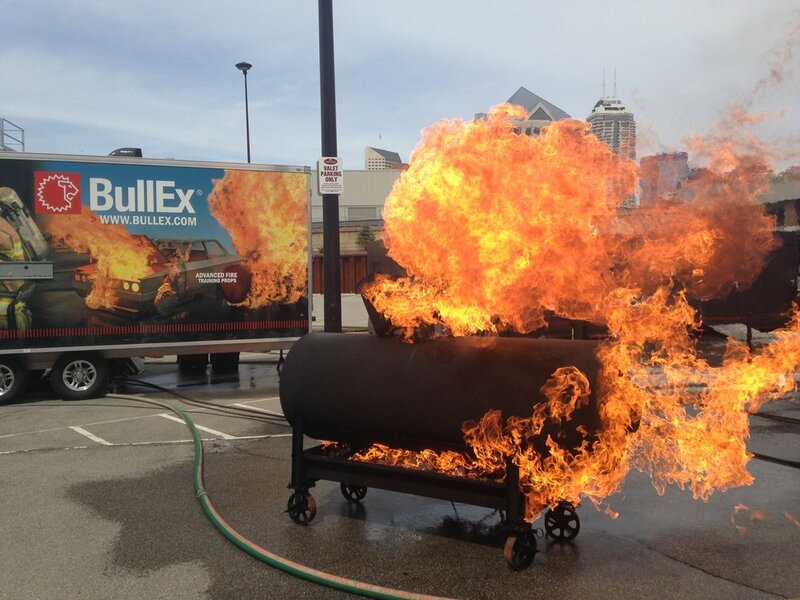 BullEx also had their dumpster and grill live fire props for you to view. These are propane fired props controlled remotely. Lastly, take a look at the inside view of the new digital fire training system.